If, for whatever reason you’re away from home and living in Noida, or do not have the time to whip up some ghar ka khana for yourself, we’ve got your back with these dabba and tiffin services in Noida. This is a pure veg delivery that has meals for lunches and dinners only. You can opt for a single vegetable dish and 4 rotis for the price of INR 75, but we say go full steam with the 80 buck mega meal that includes rice, vegetables, rotis, salad and lots more. And if you’re feeling particularly generous, then an extra 10 bucks will serve you jeera rice and raita. Can’t say we’re not impressed with that deal. Price: Starting at INR 75. As basic as it gets; the peeps at Aggarwal Tiffin services will deliver a thali consisting of dal, roti, chawal and vegetables (this changes everyday) at around 1pm for lunch and 8.30 - 9.00 pm for dinner. The timings, however, may vary depending on which part of Noida you’re living in. 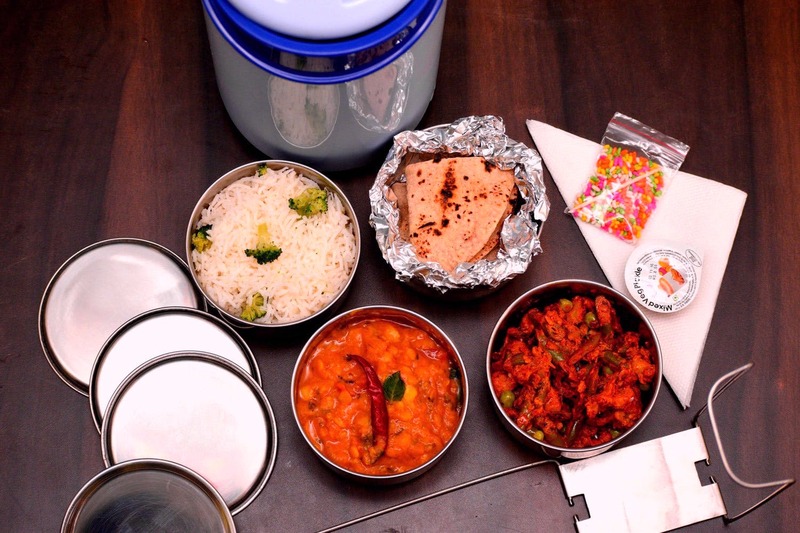 Price: Starting at INR 70 per tiffin. Again a pure vegetarian place, Balaji sends across a thali comprising dal, sabzi, roti, chawal, achaar and even salad (think kachoombar or cut up cucumbers, tomatoes and onions). If you opt for their services on a monthly basis, they’re sure to give you a little bit of a discount, depending on how many meals you choose. P.S. They don’t deliver to all the sectors so we suggest you give them a call before you decide on them. Price: Starting at INR 90 per tiffin. Folks who run this catering service have been in business for over 15 years and that shows in their food. They do hygienic, homely food (standard thali, premium thali and separate breakfast options) starting at INR 80, and also offer a monthly tiffin pack starting at INR 2,500 for one month. For INR 70, it’s difficult to rival this dabba service whose quantities and punctuality never disappoint. While your mum might make the fluffiest rotis and the yummiest yellow dal, we’re pleased to say that Mom’s Magic comes close to replicating those flavours.